And, no, this post has nothing to do with politics. Anyway, it wasn’t long until I was viewing lots of dishes with a new eye…is that waffleable? And I’ve tried a few, with varying results. I don’t fix cornbread often anymore because I’m the only one who can eat it (for poor hubby anything with baking powder in it is a no-no). And I don’t want to eat it in front of hubby since he can’t have any. But I thought waffled cornbread wouldn’t be so tempting for him, and I could get my corn fix. So I tried it just now. And while it’s not as good as a crunchy-crusted pone, it ain’t half bad. I don’t know how other recipes for cornbread would hold up, but mine worked great. See, when I make cornbread, I don’t put eggs in it. I don’t put fat in it. The only things that go into the bowl are self-rising cornmeal and buttermilk. That’s it. The buttermilk makes it hold together like an egg or flour would, and it makes it moist like oil or grease would. It’s perfect. The only thing I plan to do differently the next time I fix it is, I’ll leave it longer and see if it gets crunchier. Because for me, crunchy crust is the most important feature of good cornbread. How about you? 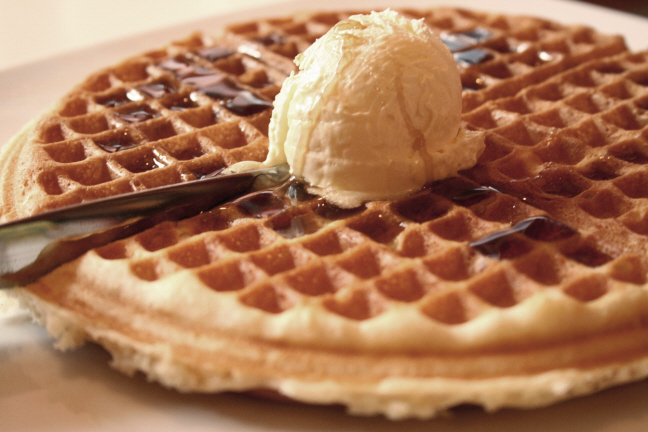 Do you use your waffle iron for cooking other than waffles?